Oliva Clinics’ journey in the IT city Bangalore extends to one more location as it opens the third state-of-the-art facility in the happening and prominent commercial and residential neighborhood of Jayanagar. Come and be a part of the Grand Opening of the new clinic at Jayanagar on 10th March 2016. What started as a thought in 2009, evolved to become an entity that created a significant difference in the lives of many. Oliva Clinics took its first step in Hyderabad seven years ago with a vision to bring back the aestheticism and essence of inner beauty to all. The initiative was met with warm reception and with the encouragement and support of it’s esteemed clients. 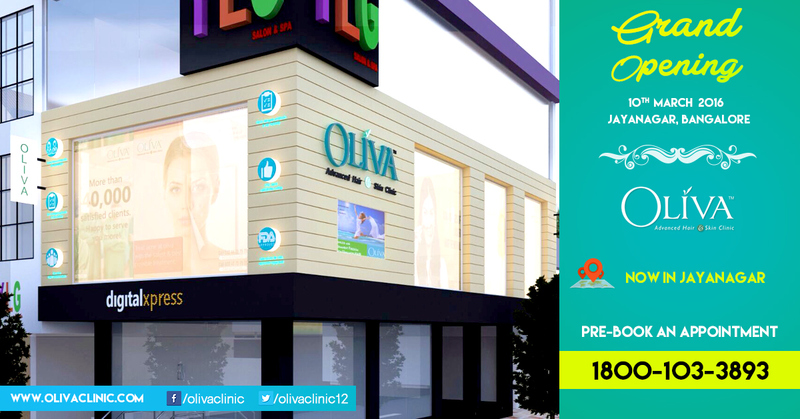 Oliva Clinics has reached many more by expanding from one to four centers as of today in Hyderabad & Secunderabad. A new chapter unfolded in the year 2014 when Oliva Clinics was welcomed by the people of the garden city of Bangalore and the first centre of Oliva Clinic was opened at Indira Nagar. The wide range of expert services struck a chord with those who gave up on seeking the apt solution to their skin and age related challenges. This led to the commencement of another center in Koramangala and the journey continues. Oliva Clinics is glad to announce that it is adding another feather in the cap by opening the third center in Bangalore. The new clinic is coming up at the famous Jayanagar on March 10th, 2016 and Oliva Clinics takes the opportunity to thank the people of Bangalore for the unflinching support and love. Akin to the Indira Nagar and Koramangala centers, the Jayanagar center will offer a holistic range of services. The expert and experienced professionals at Oliva Clinics in Jayanagar will deal with all forms of skin and hair related issues offering the best results. Adhering to its strict protocol of standard and quality, the new center will come forward with state of the art infrastructure and world class equipment. Oliva Clinics is undoubtedly the one-stop destination for all your concerns related to hair and skin. It would be a pleasure to cater to the requirement in the most efficient manner. Oliva Clinics invites the crowd of Jayanagar to grace their presence at the world class center of Oliva Clinics from March 10th onwards.